Festivals make great school fundraisers because they’re fun and effective. However, they also require extensive planning and commitment to pull them off. Here are some tips for making your next fete a smashing success. These basics of planning are the most important details to get right – without this foundation, any event will struggle. Consider how long it will realistically take to organise your fete, and set your date based on this. Make sure your date doesn’t coincide with other important local events such as holidays or major sports events. For a school fete, your school campus is probably the logical choice of venue, but make sure it can accommodate a rainy day with a large indoor hall or auditorium. Finally, the people involved will make all the difference, so choose a planning committee you can rely on to orchestrate all the different aspects of the overall event. Several things make a fete a tried-and-true way to attract guests and make money, so embrace the old favourites such as bounce castles, face painting, petting zoos, and dunking tanks. You may also want to consider auctioning off donated cakes or other goods or having the school band perform. A raffle is an excellent way to get people in the door, as well. However, in addition to these elements, also look for a way to make your event stand out. You may consider a celebrity appearance or a “balloon pop” (fill a room with balloons that contain prizes and sell needles for a chance to find one). A haircutting stall will also be favourite (recruit a local stylist to donate haircuts for the day and ask event-goers only for donations; all proceeds go towards your cause). Promote your fete at every opportunity. Use your school newsletter, your email list, the school’s website, and your social media to make sure everyone who might be interested knows about your event. Flyers in local stores and community centres are another great way to get the word out. You may also be able to find a newspaper or radio station in the area that will advertise a not-for-profit event for free. 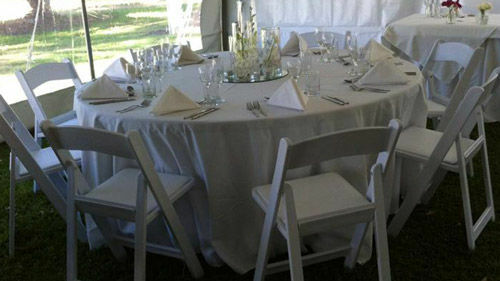 Outwest Party Rentals can help make your event a success with market stall hire in Sydney. We can provide all the market stalls you need as well as any other equipment required for a great event, such as chairs, tables, and catering supplies. Provide the perfect space for your vendors with our reliable stall hire in Sydney. We focus on excellent customer service and on-time delivery to make your event as stress-free as possible. We provide quality equipment that will do what you need it to do safely and correctly. Whether you’re putting together a fundraising fete, a field day, a corporate event, or even an outdoor wedding, Outwest Party Rentals has you covered. Contact us today to see how we can help.